VoIP conference phones use your company’s internet connection for conferencing rather than a phone line, giving businesses web-based controls, video integration, and less expensive long-distance bills. We compared the most popular VoIP conference phones offering a range of features to determine the best six for small businesses in terms of cost, quality, and functionality. Some VoIP phone service providers recommend specific brands or models of phones. However, VoIP conference phones are more universal in their compatibility and can work with any provider. One of those providers is RingCentral, which offers strong conference calling options, volume discounts, a 15-day free trial and works with all of the conference phones we evaluated. Grandstream GAC2500 (Best Overall) Businesses wanting a phone with the best balance of features, price and quality. Polycom SoundStation IP 6000 Businesses with medium-sized meeting rooms wanting premium conference call features. 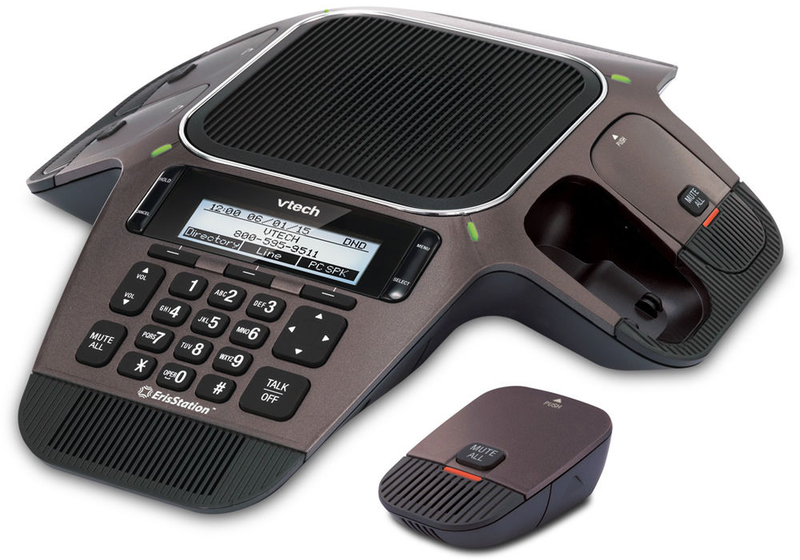 VTech ErisStation VCS754 Businesses with larger or odd-shaped rooms wanting a wired VoIP conference phone with wireless microphones. Cisco 7937G An individual office or a small conference room that does not require additional microphones. Polycom SoundStation 2 Business owners who want a completely wireless conference phone. VoIP uses your company’s internet connection rather than a phone line. As a result, they can include features such as the ability to save recordings of calls in the cloud or can email conference requests directly from the phone. However, as they are internet-based, call quality can be affected by more than the range of the microphone, and interoperability with other components of your phone system should be considered as much as price to determine the best. Price – We analyzed the cost of the conference phone as well as any additional components or accessories, such as a power supply, adapters, or extra microphones. Call Quality – We compared the range of each microphone and the quality of audio recording and playback as well as user reviews related to overall call quality. 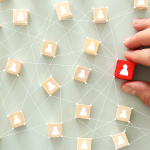 Interoperability & Connectivity – We evaluated how each conference phone connected to other components in a business’ larger telephone system and if any special adapters were required. Features & Controls – We reviewed each product’s conference call features and controls, like the ability to mute attendees or add additional callers after a call was in process. Power Supply Requirements – We analyzed each product’s power requirements, such as if it required a wired power supply, was battery powered, or its rechargeable life. User Interface – We compared each product’s user interface on the phone itself as well as if the product offered web-browser controls. Setup and Ease of Use – We considered each product’s overall ease of use based on user reviews and the difficulty of initial installation and VoIP setup. The Grandstream GAC2500 is our recommendation for the best VoIP conference phone. It has a great range of features, access to the Google Play store (which allows you to download apps to expand its capabilities), and competitive pricing. All of these create a great balance that provides tremendous value to businesses looking for a robust, customizable conference phone, which includes video conferencing. To take advantage of Grandstream GAC2500’s best features, you must first have a quality VoIP phone service. RingCentral provides integrated phone and video conferencing into a single solution and works with multiple brands of phones. Visit RingCentral’s website to learn more and to sign up to get started using VoIP phones for free with your 15-day trial. The GAC 2500 is a highly customizable, flexible web conference that is stylish and will look fantastic in any conference room. It supports seven-way voice conferencing and HD audio, and includes a 4.3-inch touchscreen that makes it easy to use while remaining competitively priced. If you’re looking for a modern conferencing solution that can be customized with apps and tailored exactly to your business needs, this is a great option. Prices for the Grandstream GAC2500 range between $449 and $469, depending on the retailer you choose. However, you can also purchase the VoIP conference phone for as low as $269, making it much more affordable than other products we compared if you already have a Power over Ethernet (PoE) adapter or compatible power adapter. The Grandstream GAC2500 has a lot of features that make it a good device for small businesses. It has a built-in conference bridge that supports up to seven callers on a conference call, has a microphone range of 12 feet, and can be customized to expand the capabilities far beyond the out-of-the-box features. The Grandstream GAC2500 includes the Grandstream market, which is an online app store. With the market, you can download the Play store and from there, download any Android app like Skype, Google Hangouts, or other conference apps to expand the conference calling abilities of your VoIP phone service. The Grandstream GAC2500 has the ability to connect to other GAC2500 units to extend the range of the microphone and speakers, or you can use the audio input jack. It has USB connectivity, so you can connect a mobile phone or additional peripherals directly to the hardware, and Wi-Fi connectivity so you can connect to the internet and use a virtual conferencing call service like Hangouts or Skype. The Grandstream GAC2500 has a really powerful scheduling function. You can schedule a call by completing a form on the digital screen, add up to six attendees, and the phone will automatically start calling each participant at the scheduled time. Once your conference call is underway, you can add additional callers, mute all the players in the meeting, and block or eject certain callers from the call. A handy tool provided by the Grandstream GAC2500 is call recording. You can record conference calls, which can be listened to at any time. The device also has an intuitive web interface that resembles the interface on the dial pad. You can control meetings directly from a web browser without needing to be near the device, schedule conference calls and customize your conference phone with a contact list and other unique pieces of information. Setting up and using the Grandstream GAC2500 is a breeze. It uses Power over Ethernet (PoE) to get its power directly from your internet connection and when the device starts up, you’re taken right to the dial pad to make your first call. The interface is highly intuitive, has a navigation menu with options to schedule conference calls, configure multiple accounts, and download apps from the app store to customize the conference phone. One item we wished the device had is an external SD card slot. The ability to use an external SD card for storage would come in handy for expanding the storage space needed for recording phone calls and conference calls. Another downside to the conference phone is that the microphone range is less than other devices, so you’ll have to purchase additional peripherals or connect it to another GAC2500 phone to increase the range. Users of the Grandstream GAC2500 say the user interface can be somewhat confusing to use, especially for those who are not technically savvy. In addition, they complain that the angle of the CAT5 connector makes wired connections prone to kinks and twists. However, users love the phone’s call quality and its overall design aesthetic. The Grandstream GAC2500 can be purchased from online stores like Amazon or Newegg. If you want to see the physical phone before purchasing, you can find it at more traditional retail stores like Office Depot and Staples, which is great since the hardware isn’t limited to a specific phone service or VoIP provider. Get the Grandstream GAC2500 by using the button below. The Yealink CP860 is a VoIP conference phone that doesn’t have as many digital features as other conference phones, but provides great audio performance and has several expansion options. 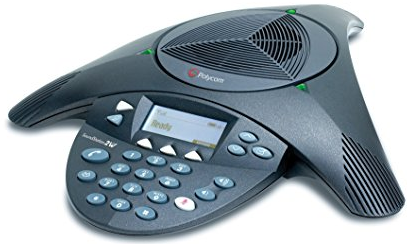 It’s one of the top conference phones recommended by OnSIP, our best Google Voice alternative, and less expensive than the Polycom SoundStation. Therefore, if you’re looking for a simple VoIP conference phone with highest quality HD-audio, this will be a good choice. Prices for the Yealink CP860 hover around $359, making it less expensive than Polycom, but pricing varies by retailers and may require purchases of additional peripherals. For example, it can be sold without a power supply, so you’ll have to purchase one separately. The costs for a compatible power supply range between $9 and $15. While the Yealink CP860 might not have a digital touchscreen or an Android framework like the Grandstream GAC2500, the audio quality has been known to be far superior. It has call recording, easy to use buttons, a large directory, and expansion ports to extend the range of the audio. Yealink CP860 has a few connectivity options that allow you to expand the capabilities of the phone. You can connect an expansion microphone, which extends the range by another five feet on either side of the speakerphone, and even connect your mobile phone to use your phone’s calling and conferencing features through the Yealink CP860’s speakerphone. Compared to the Grandstream GAC2500, the Yealink CP860’s call controls are relatively light. It gives you the ability to put callers on hold, mute and call other participants to include them in the call, but unlike the GAC2500, the call must be scheduled elsewhere. It has a feature called acoustic echo canceling, which eliminates the echoes and feedback loops that occur when a participant forgets to mute their microphone on a conference call. The Yealink CP860 also allows for call recording. It has a USB port that accepts storage devices of any size for recording calls onto an external storage device. If you’re on a conference call and want those recorded, you can simply insert a USB drive into the port and the recording begins automatically. The Yealink CP860 is relatively simple. It comes with a long, 20-foot Ethernet cable and uses Power over Ethernet (PoE) to draw its power directly from your internet connection. The large buttons make it easy to dial numbers, mute callers and easily turn the volume up and down. It works well for up to 10 feet away from the speakerphone and the range can be easily extended with the microphone. Not having a power supply bundled with the phone is a disadvantage because it requires a special PoE adapter or power injector to work properly. The Yealink CP860 isn’t Android-based, like the Grandstream GAC2500, so you won’t be able to add additional features with mobile apps and software. Those who use the Yealink conference phone feel that it’s a great device and provides a lot of value. Some find it an attractive speakerphone and love the audio performance provided by such a small device. The Yealink CP860 can be purchased directly from the manufacturer or from online stores like Amazon. You can also find this VoIP conference phone in physical retail stores like Walmart and Best Buy. Get the Yealink CP860 by using the button below. The Polycom SoundStation IP 6000 is a VoIP conference phone designed for businesses whose conference needs can be met with a centrally-placed conference phone and two additional wired microphones. It’s the standard in the industry, though one of the more expensive, featuring remarkable HD voice clarity. This is a good choice for small to medium-sized businesses with average-sized conference rooms needed premium features. The price for the Polycom SoundStation IP 6000 conference phone is more expensive than the other VoIP conference phones. However, it does include a power supply, and the price for both is usually between $615 and $675, depending on the retailer. The Polycom SoundStation IP 6000 has features that include HD voice technology to make your conference calls sound clearer and more lifelike, and a microphone that picks up sound from up to 12 feet away. There is also optional expansion microphones and support for lapel microphones providing even more flexible room coverage. The Polycom SoundStation IP 6000 doesn’t have as many connectivity options as more advanced phones like the Grandstream GAC2500. You can expand the range with additional microphones or by chaining multiple phones together, and it can be easily programmed to work with either a VoIP phone system or a traditional phone line. Similar to the Yealink CP860, the Polycom SoundStation IP 6000 is relatively simple and doesn’t have more than the standard set of phone features. You can put callers on hold, mute the call and call other participants to join the conference. Setting up and using the Polycom SoundStation IP 6000 is relatively simple. It’s one of the most common VoIP conference phones and its features resemble more traditional phones. It uses PoE for power, and once it’s set up, works very well with medium to large conference rooms. It’s essentially a big speakerphone with a really good microphone system. Business owners who have used the SoundStation IP 6000 feel that it’s a really good speakerphone that doesn’t over-complicate the process with additional apps and features. Others feel that it provides excellent performance and love the sound quality. The SoundStation IP 6000, like the majority of VoIP conference phones, can be purchased directly from the manufacturer or from online stores like Amazon. Some business phone system providers will also offer this phone when you subscribe to a VoIP service plan, and you can also find it in retail stores. Get the SoundStation IP 6000 by using the button below. The VTech ErisStation VCS754 is another VoIP conference phone that’s easy to use and is offered for a competitive price of less than $400. The phone is unique in that it comes with four additional wireless microphones to expand the conference phone’s range far beyond most other similarly priced products. These wireless microphones allow it to work in large as well as odd-shaped rooms, without requiring participants to shout to be heard. The VTech ErisStation VCS754 costs $349.99 and includes everything you’ll need for your conference room, making it a more affordable option. In addition, an Ethernet cable is provided, along with four wireless microphones and a power adapter, so you won’t need to purchase a separate adapter for this VoIP conference phone. One of the standout features of this device is that it allows for three different accounts and identities, which means you can have three different numbers for incoming and outgoing calls with the conference phone. It has great connectivity options and works well with just about any VoIP phone system. The VTech ErisStation VCS754 has a USB port that allows you to connect a PC-based softphone, so if your desktop softphone app supports external devices like headsets, there’s a pretty good chance you’ll be able to use this VoIP conference phone to hold conference calls with your softphone. The call controls of the VTech ErisStation VCS754 are pretty standard, with no difference when compared to a traditional phone. You can mute callers and place them on hold. If the VoIP conference phone is connected to a softphone, it’ll support any features provided by your softphone or VoIP phone provider, like call waiting and support for multiple users. Setting up the VTech ErisStation VCS754 is pretty simple and can be completed in a matter of minutes. All parts of the package are clearly labeled with instructions that help you understand the purpose of each specific piece and exactly how to assemble the VoIP conference phone. The dial pad is programmable, allowing you to easily store numbers that you frequently call or the number for your conference bridge. The VTech ErisStation VCS754’s mute function can be a bit problematic. If you’re using one of the wireless microphones and hit the mute button, it mutes all callers that are connected to the VoIP conference phone, rather than just that specific microphone. It would be great if it had a secondary mute button or another function that allows you to mute just one individual microphone or connected user. Those who use the VTech ErisStation VCS754 feel that it’s a great device and provides a lot of value. Some find it an attractive speakerphone and love the audio performance provided by such a small device. Just like all the other VoIP conference phones, the VTech ErisStation VCS754 can be purchased directly from the manufacturer or from online stores like Amazon. You can also find this VoIP conference phone in physical retail stores like Walmart and Best Buy. Get the VCS754 by using the button below. The Cisco 7937G is a very simple but easy to use, and competitively priced, VoIP conference phone. It’s designed for small rooms like an office and has a 360-degree microphone with a range of about seven feet. If you have a small team with only a handful of employees and generally meet in an office, this conference phone would be a good fit for you. The cost for the Cisco 7937G averages about $495 for the phone, putting it in line with the Grandstream GAC2500, and is significantly less than a Polycom phone. However, like other conference phones, the price will vary based on the retailer and if you’re buying a new or refurbished VoIP conference phone. 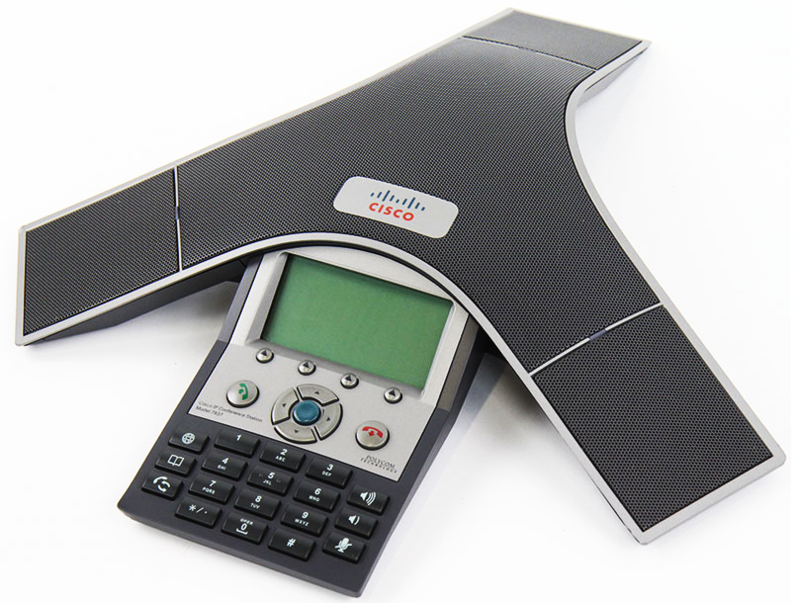 The Cisco 7937G has a simple 3.4-inch display, with four menu buttons that allow you to adjust preferences, and set your ringtones and phone information. There isn’t a lot more to this VoIP conference phone in regards to features, but the biggest benefit of using this phone is the sound quality for rooms requiring a range of less than seven feet, which makes it perfect for a small conference room or perhaps even a personal office speakerphone. Setting up the Cisco 7937G is relatively easy. It comes with an Ethernet cable for connectivity and you’ll need a Power over Ethernet switch, or a power injector, to set up the phone. The soft buttons on the device make it easy to navigate through the menu and modify the phone’s settings. The Cisco 7937 is nothing more than a speakerphone with calling capabilities. It’s lacking a lot of the features we’ve seen in other VoIP conference phones, such as recording, advanced controls, and wireless options. Those who have used this VoIP conference phone feel that it’s a very simple phone that’s good for what it is. They’re satisfied with the call quality, but others wish the range could be extended to support more people and larger rooms. The Cisco 7937G can be purchased from online retailers like Newegg and Amazon. You can also get this VoIP conference phone directly from the manufacturer. Get the Cisco 7937G by using the button below. The Polycom SoundStation 2W is a VoIP conference phone with a lot of similarities to the Polycom SoundStation IP 6000. It’s unique because it does not require direct power or a phone line and is a completely wireless conference phone. It is also the most expensive of the products we compared. However, if you need the flexibility of a wireless conference phone to hold your meetings in a large area without cables, this is the best choice. The Polycom SoundStation 2W costs $729, making it the most expensive of the VoIP conference phones we compared. However, you can find it for significantly less than the list price and save up to 75 percent if you purchase it used or refurbished through online retailers like Amazon or Newegg. 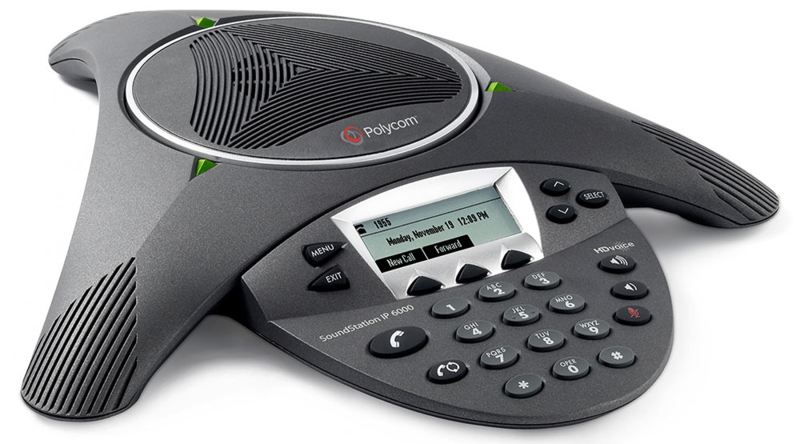 There are several different variations of the Polycom SoundStation 2, such as the 2W or the 2EX. We evaluated the 2W, which can be used as either a standard analog phone or can be connected to your computer to enhance the audio quality of a Skype or RingCentral call. It can also connect to your cell phone and has several other notable features. The Polycom SoundStation 2W has a wireless range of 150 feet, and as long as the power and phone line are connected to the base station in a nearby room, you can move the conference phone to anywhere within that range and conduct your conference calls wirelessly. The conference call controls of the Polycom SoundStation 2W are pretty much the same as other VoIP conference phones. Mute, hold and redial buttons are available. The conference phone also has Acoustic Clarity Technology, which eliminates echoes and background noises during a conference call. The Polycom SoundStation 2W comes with the conference phone console, a rechargeable battery pack, and adapters for connecting the conference phone to your computer or smartphone. It takes roughly eight hours to fully charge the battery and the included instructions make setup a breeze. The Polycom SoundStation 2W isn’t expandable beyond what comes in the box, unlike other Polycom phones. It also lacks the GAC2500’s Android operating system and its integration with Google Play via its apps. The included USB port is reserved for updating the firmware and doesn’t record calls to an external storage device. Those who use this VoIP conference phone feel that it’s a great device and love that it can be used wirelessly. They love the quality of the sound through the speakerphones and the ability to conduct conference calls from any room with the same device. The Polycom SoundStation 2W can be purchased directly from the manufacturer or from online stores like Amazon. You can also find this VoIP conference phone in physical retail stores like Walmart and Best Buy. Get the Polycom SoundStation 2W by using the button below. VoIP conference phones offer features that are not available using traditional phone lines, such as the ability to record and store calls directly in the cloud. We recommend the Grandstream GAC2500 as the best VoIP conference phone for small businesses due to its balance of great features, call quality and competitive price. If you are considering switching from a traditional phone service to a VoIP phone system, a provider like RingCentral can make the process painless. In addition to providing an integrated phone, video, and conferencing system, RingCentral gives you the option of renting equipment, which gives you the chance to try a phone before spending a fortune. Visit RingCentral’s website to learn more and to sign up for a free 15-day trial today. Hi! I'm Jenkins (yes, that is my first name), an information technology professional with over 10 years of IT experience in a wide range of industries. I've always had a love for technology, earning my bachelor's degree in Business management with a minor in Software engineering and later on a graduate certificate in Computer Science. My career has provided me with great experiences from being a web developer to being a Director of Technology. In my spare time, you'll find me enjoying every moment with my wife & kids, exploring different corners of the world, meeting new people and looking for great food.